Map: Which Countries Have The Slowest Elite Runners? Everyone knows Jamaica tends to produce the best sprinters and Ethiopia often has the best distance runners, but how do other countries' top runners fare compare to the best in the world? 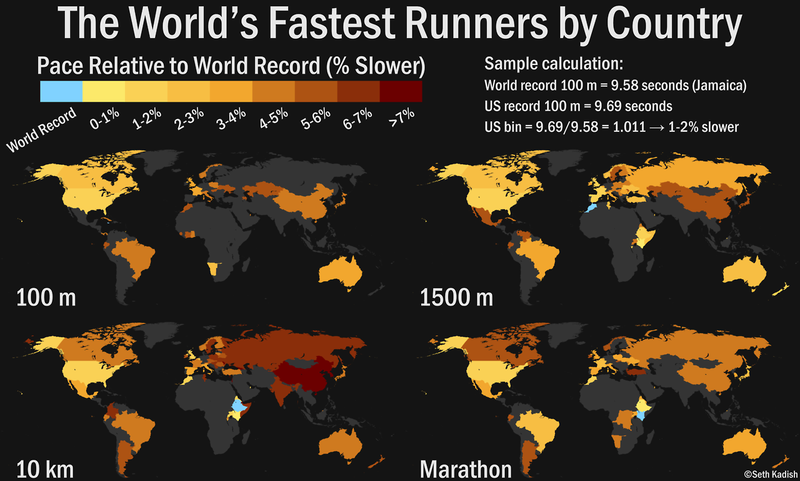 Seth Kadish created a map that visualizes how much slower a country's best time is compared to the world record on his Vizual Statistix blog. He did this for the 100 m, 1500 m, 10 km, and marathons using data from alltime-athletics.com. The U.S. fares pretty well and is no more than 2 percent slower than the world record for each race. As expected, African countries fare better in distance runs than they do in the 100 m. Overall, Asian countries tend to do the worst among the represented countries, as most are 3 to 4 percent slower than the world record in every race. In the 10 km most of the continent is at least 6 percent slower than the world record. South American countries also don't fare too well in the 10 km. The gray areas indicate data wasn't available for that country, and obviously, this accounts for a big portion of the world. These are generally nations that aren't as competitive in these events, however, so the map can stand as a broad measuring stick of where the nations stand.